Last week, Palestinian activist Bassem Tamimi published a letter on his Facebook page showing that his visa to come to the United States was revoked on March 1. In a story published Wednesday, the Palestine News Network (PNN) continued to push his claim that the U.S. action somehow was in retaliation for a civil lawsuit he and others filed against dozens of Israeli supporters and companies doing business there. "To stop our effort against the Israeli occupation, the American consulate revoked my Visa," Tamimi wrote March 8. The whole story is a lie. 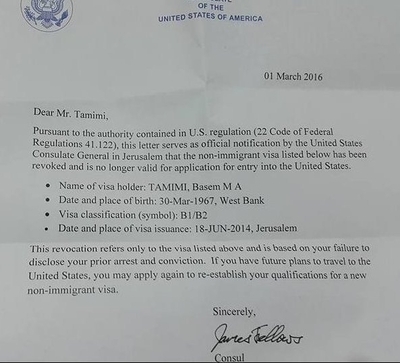 Tamimi would have us believe that American bureaucracy is so efficient, so nimble, that it processed a visa revocation overnight. The lawsuit was filed March 7 in Washington, D.C. district court, the day before Tamimi published it. In addition, the visa revocation letter is dated March 1. In order for it to be payback for the lawsuit, the Zionist Occupiers must have perfected time travel. In addition, I know Tamimi is spreading a lie because I helped secure the documents which proved he lied to U.S. officials by denying his arrest record. 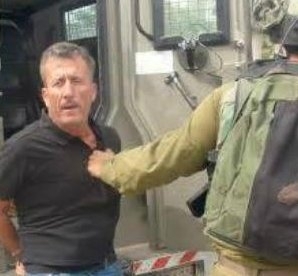 In fact, he has been arrested repeatedly, including a 2010 arrest for incitement after Tamimi provoked demonstrators to repeatedly throw rocks at Israeli soldiers in the West Bank. According to Israeli court records, Tamimi planned the confrontations, first by gathering young men from a nearby village, encouraging them to throw stones and organizing their stone throwing . When soldiers approached, he provided reconnaissance to ensure they would not get caught. He also arranged for ambulances to be immediately available to the stone throwers in case any of them were injured. He was convicted on all the charges and sentenced to 30 months in jail. When Tamimi was in the United States last September on a cross country bash-Israel tour that was co-sponsored by Amnesty International, an Israeli source informed me of Tamimi's conviction. I relayed the information to Immigration and Customs Enforcement (ICE). U.S. government agents obtained Tamimi's arrest and conviction records from Israel. ICE agents reviewed Tamimi's visa application and discovered that he lied by not checking a box indicating he had been arrested before. This is a standard question asked of all applicants. As a result, an administrative investigation was immediately initiated into Tamimi's false statements. The review process took months to complete and resulted in a determination that Tamimi had lied on his visa application. As is standard for those who do not disclose their arrest records on their visa or immigration forms, Tamimi's right to a visa to the United States was permanently revoked. It culminated in the letter that Tamimi saw fit to share with the world. The PNN story dismisses the arrests as "arbitrary" and cited Tamimi saying the detentions are "ways of Israeli occupation to silence the Palestinian voice." Tamimi could have been forthcoming with the U.S. Consulate office and in his visa application, argued the arrests were improper and let the State Department make an informed decision. Instead, he lied. Now he's complaining that he got caught in that lie. It's an odd lie to tell, given that the U.S. has prosecuted Palestinians, among many others, for similar lies on immigration applications. But it is not necessarily out of character. In convicting Tamimi of incitement in 2012, the Israeli judge determined that he "lied to the court, did not express regret for what he had done and did not take responsibility for his actions." During a Sept. 26 appearance in Atlanta, Tamimi's arrest record was not something to hide, but a means of establishing his bona fides. "I have been in jail nine times in my life," he said. He spent five weeks in the United States during September and October, pushing the campaign to boycott, divest from, and sanction Israel. Among his stops was a third grade class in Ithaca, N.Y. where he reportedly spoke about the suffering of Palestinian children. As the website Legal Insurrection reported in October, Tamimi used his Facebook page to promote an anti-Semitic blood libel that Israel arrests Palestinian children "To STEAL THEIR ORGANS." The claim Tamimi reposted included a picture of a person's torso with a long wound stitched up along the side. 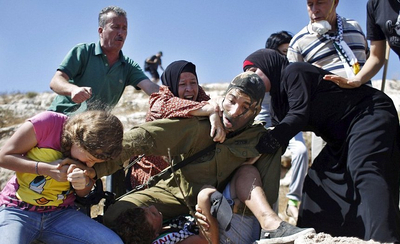 Tamimi uses children as tools to instigate confrontations with Israelis, including having his daughter, dubbed "Shirley Temper," scream at soldiers in hopes of provoking images that portray them as cruel or brutal. "When we are able to get a video like this, we can use it to great effect," he said during the U.S. speaking tour. "When enough people here see these videos and hear our stories, it can start a kind of intifada against Israel in the United States." Tamimi's visa has been revoked permanently. In order to enter the United States again, he will have to obtain a waiver, which is a benefit rarely given. Thank you for bringing this subject to light in the public narrative. Mr. Tamimi is a liar extraordinaire.